While I don’t recall offhand if all three books shipped the same week, or what order they came out in…to me, Prime #1 is where it all began…I remember it from that first month–June 1993–and I followed the series itself to its conclusion in late 1996 or so around #15 in its second volume. Whatever the original order, to me, it just feels "fitting" to dive in with Prime #1 to start my journey back into the Ultraverse. Another thing going for this issue is that it has an audio-drama of sorts, from a one-issue "CD-Romix-Comix" thing where the first issue was chopped up into panels to display on-screen with some quasi-animation–think early "Motion Comics" or such–along with a cast audio track with sound effects and such. Having the AUDIO from that which often makes its way onto my iPod, this issue is one that I simply cannot read at a normal pace–I read it with the voices in my head, the vocal pace of the audio piece unfolding in my head. I can also virtually recite the entirety of the issue from memory, so there are no surprises revisiting THIS issue. The comic is a lot "bigger," brighter, and "’90s" than I sometimes remember…but that’s something that makes sense, as this came out in 1993–as "the ’90s" were getting into gear–and that was a time with "big" art, non-traditional page layouts, and of course, the (infamous?) rise of computer coloring techniques. Though I know Breyfogle had a significant run with Batman in Detective Comics (including my own first-ever issue! ), this series doesn’t look like what I remember of Batman…helping show a range as an artist, being able to tackle different types of material. 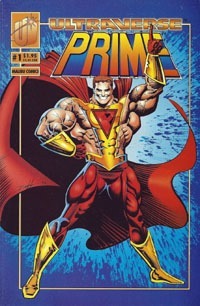 Prime as a character is big, bold, and really very over-the-top with the huge muscles, and outlandish physique…take your mental image of the biggest, buffest super-hero (other than Prime! ), amp that up, and you may well HAVE Prime. This comes into play with the character’s origin, but also helps the character stand out in its own way. The cover is one of the more "iconic" covers out there, to me…certainly for my own experience with it, as well as being a generic/"iconic" sort of cover before that was totally "standard." 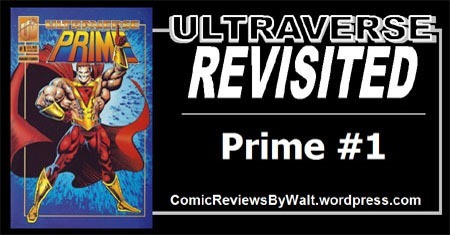 I also have long REALLY dug the trade dress for these early Ultraverse issues–with the 3-D-stylized "U" and the issue number/price, publisher (Malibu Comics) in "corner boxes," with the Ultraverse logo as a banner across the top, and a border line framing the entire image, though said image breaks free of any constraint offered by this. Story-wise, in some ways, this issue goes against my own sensibilities in feeling strongly that first issues need to introduce not only the main character, but also a supporting cast and antagonist, who/what they are and at least hints of motivation, and all that. I suppose this issue gets a "pass" on that for being 25 years old (twice as old as I was when it saw publication), and long since knowing where stuff goes, and all that…so it’s impossible to TRULY judge this by the same standard as I would a new #1 issue released in 2018. But this also comes from 1993, when collected editions were still pretty rare overall, and ongoing comic series issued in monthly form did not have (essentially) companion "graphic novel editions" trailing relatively close behind. So while this first issue doesn’t reveal everything, it’s by no means playing up to some "graphic novel" version. We open on the first of several main scenes, as we learn a bit about this Prime character by way of others telling of their experiences encountering him. First, a disgraced gym teacher, attacked by Prime and accused of inappropriate interaction with young female students (this was 1993, but still right at home in a way with headlines 25 years later). Then we learn of Prime demolishing a drug house. Finally, he takes on terrorists in Somalia…thousands of miles away! Amidst a shadowy figure interviewing the first two and learning of the latter via tv news reports, we get further world-building and exposition via the tv news/entertainment reports–stuff about Hardcase (who had his own #1 the same month as Prime), a character called Prototype (who would come back into play later), as well as a slight sense of the way the public views these ultra-humans. As said above, there’s no surprise for me in reading this issue, outside of reminder of how colorful it is, how ’90s it is. I see this issue frequently in bargain bins…I see many of the early Ultraverse #1s in such bins…but especially for 25 cents to 50 cents, I recommend checking it out, whether as an artifact from its time, or to get started on an Ultraverse journey of your own.